A red robin cares for her baby birds video & Montessori printable. How does a bird care for her chicks? What does a bird eat? How do birds feed their chicks? And, where does the poop go? Here’s a free printable of Parts of a Bird. The Montessori printable; 3 part cards, labeled and unlabeled chart, can be used to make a mini book, a lapbook or a notebook. If you would like to see more please subscribe and leave a comment letting Tyler know. « Farm Life Montessori Erdkinder Style. Love this! My daughter is really into birds right now especially since they’re really starting to sing. I may just have to use some of this in our Spring learning theme. Great job making this video Tyler! Thank you for sharing. I had the pleasure of watching baby birds grow that were in my barn. It’s actually a small log structure. Mama bird had too many babies for her to feed. 2 got pushed out of the nest. 2 were doing fine, but not the 5th one.We used a flour sifter to get mosquito larvae from a water hole. Then we crushed them in a small bowl and fed the babies with a baby spoon. It took awhile for me to learn how to get it in only the mouth, and not up the nose. Hehe. The poor hungry little guy grew up big and strong. We would knock on the wall of the barn to let mama bird know we were coming, because when we startled her, she flew out the door and almost flew right into our heads! The funny part was, we accidentally trained those wild baby birds that the knock meant food was coming. They started crying at us just like the baby birds did to mama bird in your video! Did you know baby bird heads and beaks are soft and squishy? I thought you might like that story. Keep up the good work with your scientific observation! This is great! What a great video. you can see everything so well! Great job, Tyler! You look just like your mommy! I really enjoyed your video, Tyler! I loved the way the baby birds opened their mouths and reached up for the food. 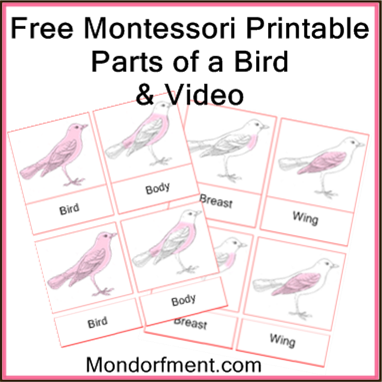 I featured the Parts of a Bird printable as the Free Printable of the Day at the Living Montessori Now Facebook page https://www.facebook.com/LivingMontessoriNow (and on Pinterest). So neat! Thanks for sharing Tyler! What a great video! Love it! My kids loved watching the Mama Robin feed the babies. I’m glad you enjoyed the video. I’m going to try and get another one up here hopefully. Thanks for watching! Good job Tyler! Enjoyed the video! Thank you very much. I hope you didn’t gag when you saw the momma eat the poop sack. My kids will love this 🙂 Thanks for sharing! Thank you very much. I’m happy to show the video. What was your favorite part? My favorite part was when the babies lift up their heads and the momma puts in the food.